English Springer Spaniels are athletic and lean. They’re high energy dogs to be able to handle the long hunting sessions they were bred for. Feeding your Springer cheap food only adds empty calories and could cause weight gain. The English Springer Spaniel has a long history of pulling double duty as a mild-mannered house dog during the week and a driven hunting companion on the weekends. Bred to be bird dogs, this breed has a sweet temperament that loves having a job to do. Your English Springer Spaniel needs quality food to keep up with its health and nutrition needs. While cheap dog foods will give your Springer, the calorie count it requires, only a quality food will help your English Springer Spaniel thrive. Let’s look at what makes the best dog foods for English Springer Spaniels and how to choose the right one. Plus, we’ve put together a list of our favorites for all life stages so your companion can thrive throughout life. Let’s take a look. Joints are often an issue with athletic dogs, so quality foods can help maintain cushioning and strengthen muscle groups that help keep joints healthy. They also need food that can help them maintain a healthy weight throughout their lives because this is key to keeping your Springer healthy and active. English Springer Spaniels are subject to many of the same health issues as athletic dogs of any other breed, but there are a few you should watch out for. Making sure to handle these health issues before they start can help you get the most out of your furry companion’s life and keep them in top shape even into the senior years. Because their ears are long and covered in fur, English Springer Spaniels are prone to ear infections and ear irritations. It’s a good idea to keep the ears trimmed and cleaned so that you don’t risk more severe infections. Foods that irritate the skin and digestive system can cause overdrive with ear irritations as well, furthering the problem. Eliminating known food allergens can help keep ear issues from getting inflamed and causing more severe damage. Dysplasia plagues athletic dogs, and while the occurrence relies on genetics, there are things you can do to help prevent complications. Dysplasia causes the joint to misform and eventually slide out of the socket, whether the hip or elbow. It can cause issues with mobility and limit your dog’s enjoyment. Good, nutrient-dense foods help support the elbows and hips by building muscle groups that stabilize weak joints and rebuild cushioning. Foods that supplement with glucosamine and chondroitin can strengthen joints and prevent the abnormal wear and tear of dysplasia. Springer Spaniels will need to maintain a healthy weight to fulfill their athletic abilities. They need a nutrient dense food that helps them grow properly during the puppy period and helps them maintain weight during the slower elderly years. Foods need proper proteins and complex carbohydrates with no cheap fillers that can add any empty calories. Springers will need to have portion sizes carefully controlled so that they don’t overeat accidentally. During their peak years, this is especially critical because they will need plenty of nutrients for energy without any extra calories. Proteins should come from whole sources with no by-product meals. Complete proteins give your Spaniel the building blocks for healthy muscle growth and to maintain strength in joints. It can also help keep the healthy coat right at the root. Complementing proteins are sources of complex carbohydrates that can help give your Spaniel energy all day long without adding empty calories. Complex carbohydrates avoid spiking sugar and prevent your Spaniel from packing on weight. Fiber provides weight control and helps your Spaniel keep from overeating. Fiber also helps keep your Spaniel’s digestion healthy by encouraging healthy bowel movements and giving plenty of prebiotics to support the gut flora. It controls weight and keeps gas under control. Other healthy ingredients can be whole veggies and fruits which provide vitamins and minerals. Glucosamine and Chondroitin support joint health. Essential fatty acids help protect skin and coat by building health layers and keeping the coat soft. It can also help with skin irritations and other types of inflammation. 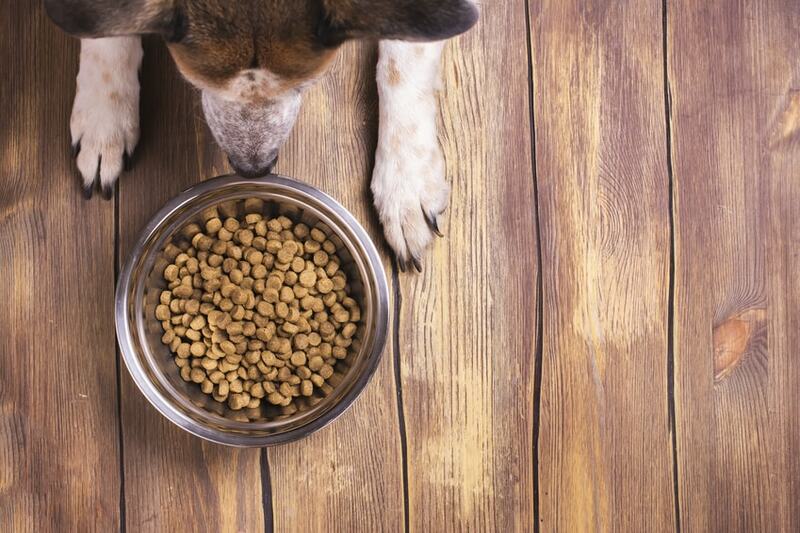 Some of the most common ingredients in cheap dog foods are the ones that can cause serious health concerns. Fillers such as soy and corn are often the first ingredients for foods to lower cost, but over time can cause unnecessary weight gain and digestive irritations. THese should never be present anywhere in your dog’s diet. Other common food allergens include chicken or other poultry by-product meals and artificial flavors and colors. Foods should never contain any of these ingredients either. Artificial colors are only there for human benefit and have no bearing on whether the dog will eat food or not, but they can disrupt digestion. Something new to look out for may be potatoes, peas, and legumes. These have recently been connected to higher rates of Canine Dilated Cardiomyopathy or an enlarged heart. We aren’t sure of the connection, but we recommend that you avoid these ingredients in the first three listed on your dog’s food and possibly avoid peas altogether until we understand more about the connection. Some of your cheap, big box store brands are common offenders with these ingredients, so here are a few to watch out for. Put your dog’s health above saving money and you should save money on vet visits in the long run. Ol Roy: Some of the first ingredients are yellow corn, meat and bone meal, soybean meal, and poultry by-product meal. These are all the top food allergens, and they’re listed as the first four ingredients. You might be able to save some money in the short term, but we think that will translate to more vet visits later. Purina Beneful: The first ingredient listed is meat, but after that corn, gluten, and chicken by-product meal shows up at various points in the ingredients list. Kibbles N Bits: The first ingredients are corn and soybean meal followed by meat and bone meals and BHA a suspected carcinogen as a preservative. It’s also full of artificial flavors and colors. Again, it’s certainly cheap, but you’ll pay for it in the long run. A healthy adult Springer Spaniel consumes just under 1353 calories per day to stay healthy and maintain weight. You should consult your veterinarian for specific feeding recommendations and make sure to follow the serving sizes listed on your dog food. However, here are general recommendations. Puppies: Puppies grow quickly, and their food recommendations are likely to change rapidly. Make sure you follow your vet’s recommendations to keep growth to a proper rate. Adults: Generally, adults should maintain a weight anywhere between 44 and 55 pounds. Servings should be cut in half and fed twice per day to help the Spaniel keep up energy all day. Seniors: Seniors will get close to the same recommendations, but your vet may reduce those recommendations to just under 1000 calories per day to account for a drop in activity. Maintaining proper weight here is critical. Let’s keep your Springer Spaniel healthy and happy. We’ve put together a list of recommendations for the best food for your English Springer Spaniel for a range of life stages and budgets. Let’s break it all down. Back Country Raw provides a premium kibble blended with freeze-dried bits of meat for texture and plenty of protein. Merrick uses only whole sources of protein and quality complex carbohydrates to provide energy and muscle support all day. Whole fruits and veggies give your dog vitamins and minerals while essential fatty acids support coat and skin health. It’s grain free and contains no artificial flavors or colors. It also helps support joints with glucosamine and chondroitin. Merrick uses only whole, premium ingredients to provide your dog with nutrient-dense foods. The company makes and tests food right in local kitchens just like it’s been doing for the past 25 years. Taste of the Wild’s grain-free formula features quality proteins from whole sources to help build healthy muscles and support overall health. Omega fatty acids from fish sources provide plenty of support to skin and coat as well as prevent inflammation. Real fruits and veggies provide antioxidants and vitamins while a probiotic designed to work with the canine digestive system supports healthy digestion. It also includes fiber with prebiotic support. Taste of the Wild is a section of Diamond Pet Food Company, a USA based family owned dog food company. They use whole ingredients to mimic the ancestral diet of canines and provide your dog with rich, nutrient dense meals. NomNomNow’s cooked meals are a good balance between dry food and raw diets. Meals are prepared and arrive at your house ready to serve or store in the fridge (or freezer). Tasty Turkey Fare is a non-allergenic option that uses whole turkey and eggs for quality proteins plus whole fruits and veggies to give antioxidant and vitamin support. It’s clean and limited ingredient. It should appeal to picky dogs and help alleviate the digestive issues of dogs with severe allergies. Portion sizes are simple, and foods contain balanced nutrition created by a vet. NomNomNow was created by a veterinarian who wanted to provide an ancestral diet in easy to serve portions that wouldn’t overwhelm the way raw food diets often do. The formula is created right in the kitchen and shipped out ready to serve. Puppies need controlled growth. Whole protein sources keep muscles healthy and build good bones. Fatty acids help with brain development while fruits and veggies provide essential vitamins and minerals. Wellness Core uses whole proteins from chicken and turkey to provide the building blocks of healthy growth for your puppy. It includes fatty acids, including DHA, for healthy skin, coat, and brain development. Whole veggies and fruits give your puppy plenty of vitamins and antioxidants while guaranteed levels of phosphorus and calcium support healthy bones. It has no fillers, artificial flavors or colors, and uses probiotics to promote digestion. Wellness Core uses a team of veterinarians and pet experts to create a balanced, grain free food that doesn’t sacrifice any nutritional requirements. Puppies get everything they need to build healthy bodies and maintain optimum growth. This Freestyle recipe uses both whole chicken and salmon for complete proteins for growing bodies. It’s grain free and uses lentils as a source of complex carbohydrates and fiber. It has guaranteed levels of DHA in addition to fatty acids for brain development, healthy skin, and coat. It’s low glycemic and will help control growth. Plus, it uses antioxidants and probiotics to support digestion. Nulo was created about ten years ago in a focus on providing low carb and low glycemic foods to dogs. It’s manufactured in states with an emphasis on sustainable farming and strives to provide a quality ancestral diet for your puppy. It’s likely that your senior has slowed down a bit, so weight control is critical here. Formulas should provide plenty of nutrients but cut back on the calories to help your senior control weight. Fiber is key to this as well. Also, look for formulas with glucosamine or chondroitin for joint health. Merrick’s senior food uses a proper blend of protein and complex carbohydrate sources to balance calories with weight control. It features whole fruits and veggies for antioxidant support plus glucosamine and chondroitin to support healthy joints. Merrick uses premium kibbles formulated across all life stages to help your dog transition to its golden years with grace. Whole balanced meals help control weight and support your dog’s aging joints, eyes, and skin. Blue Buffalo’s life protection includes their proprietary LifeSource bits, a blend of antioxidants and vitamins to support your senior’s health. Chicken and brown rice adds dense nutrition without empty fillers for better weight control, plus vitamins and antioxidants to round out nutritional needs. Blue Buffalo was started by a family in search of the best nutrition for their beloved Airedale Terrier, Blue. Since then, the company has provided a balanced diet to support your dog in all stages of life. Feeding your English Springer Spaniel well is the key to controlling weight and maintaining muscle health all throughout life. Athletic dogs need plenty of solid nutritional support for all their life stages so that you can enjoy your beloved companion from birth into the golden years. Don’t compromise on nutrition because this is key to your dog’s quality of life and happiness.